USofA Pageants LLC has certain expectations of anyone that desires to participate in its various pageants or contests. Contestants are expected to conduct themselves in an adult and professional manner throughout the entire pageant or contest experience. This starts from the moment the doors open for registration and concludes once the dressing room is closed after the pageant or contest is over. Titleholders, alternates, representatives, promoters, and staff are likewise expected to conduct themselves in an adult and professional manner from the moment they enter the venue until they leave the venue. We realize that competing in a pageant or contest can be an emotional experience. Contestants put forth a lot of effort and resources into competition and there are times when the results are not what is anticipated or expected. Regardless of the outcome of a pageant or contest, USofA Pageants LLC expects everyone involved to conduct themselves in an adult and professional manner. The actions of Liyah Alize at the Miss Gay Arkansas USofA pageant were in total disregard of these expectations. We are all adults in this industry and we should act accordingly. Throwing awards into a trash can, throwing items in the dressing room, insulting national titleholders, disrespecting the promoters, creating a scene in the dressing room, and demanding a refund on her entry fees are not actions that USofA Pageants LLC will tolerate from anyone. 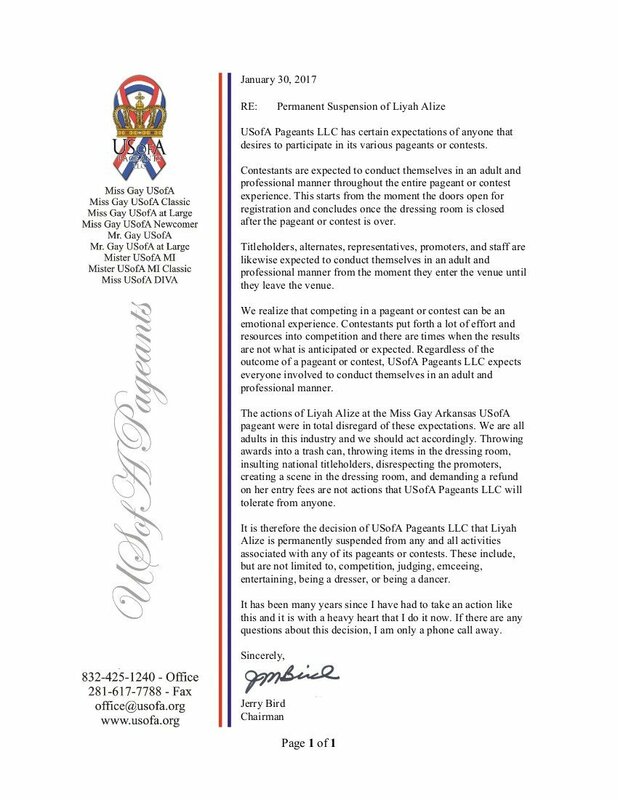 It is therefore the decision of USofA Pageants LLC that Liyah Alize is permanently suspended from any and all activities associated with any of its pageants or contests. These include, but are not limited to, competition, judging, emceeing, entertaining, being a dresser, or being a dancer. It has been many years since I have had to take an action like this and it is with a heavy heart that I do it now. If there are any questions about this decision, I am only a phone call away.